The Great Blue Turaco feeds mainly on fruits from several plants’ species, but it also consumes buds, shoots, leaves and flowers, and some insects. 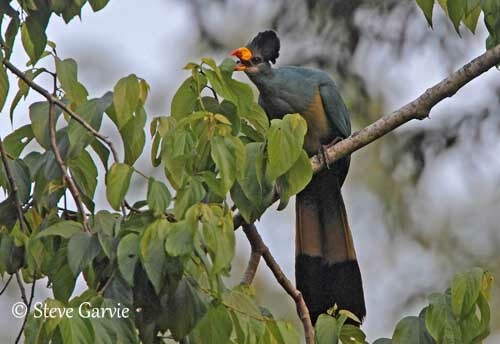 The Great Blue Turaco is widespread and appears relatively common throughout its range. However, the species is threatened by deforestation in Nigeria. It is hunted in W Africa for consumption, and still trapped for trade in some parts of the range. It is able to accept small patches of forest if not persecuted, and currently, this species is not globally threatened. The Great Blue Turaco is the largest member of this family. The adult has turquoise-blue upperparts, including wings and tail. The tail is long and wide, and shows a broad, black subterminal band. Most birds have narrow blue tips. The outer rectrices are partially edged yellow. The wings lack the crimson primaries of other turacos. On the underparts, neck and upper breast are turquoise-blue. Lower breast and belly are greenish-yellow, as the undertail feathers. The tail has black subterminal band. Lower belly, undertail-coverts and tibial feathers are chestnut. On the turquoise-blue head, there is a conspicuous blue-black raised crest on forecrown and crown. Chin, throat, cheeks and outer eye-ring are greyish. The large convex bill is bright yellow with red tip. The eyes are reddish-brown, surrounded by bare dark turquoise-blue eye-ring. Legs and feet are blackish. The Great Blue Turaco feeds primarily on fruits from numerous plants’ species, but it also takes buds, shoots, leaves and flowers, and occasionally some insects. It feeds on leaves all day round, and especially in the evening. The chicks are fed with regurgitated leaves. They often forage in small flocks and several birds often gather at fruiting trees. Except during the hottest hours of the day, they start to feed at dawn and throughout the day to the dusk. At the end of the day, each group reaches its usual night perches. 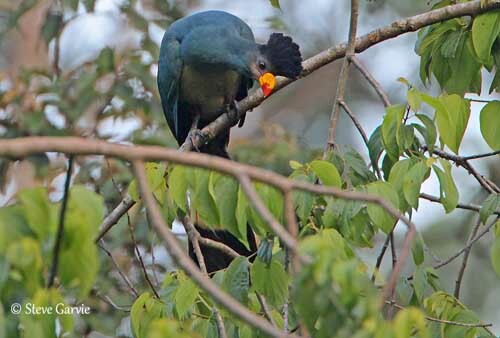 The Great Blue Turaco is very agile for climbing into the branches, and moves rapidly in trees. They are shy birds and rarely come down to the ground, except to bathe and drink. The courtship displays often begin at the onset of the rainy season. We can hear much calling, and the birds chase each other from tree to tree. They perform mutual feeding, raise and lower the crest, and expose the head and bill patterns. They bow and flick the long tail to display the coloured pattern of the rectrices. As other turacos’ species, they are territorial. They usually remain in family groups, but they also may live in territorial pairs all year round. 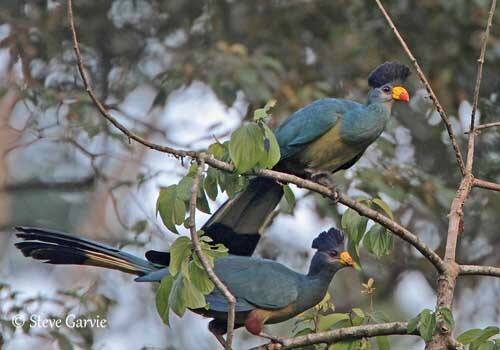 The Great Blue Turaco maintains its territory all the year, but it frequently moves to find its favoured fruiting trees. It returns to the feeding areas every day. The large fruiting trees may attract several groups. These birds live in social groups of 6-20 birds. Both sexes are similar, with female slightly larger than male. The juvenile is duller. It has greyer breast and shorter crest. The Great Blue Turaco gives loud series of deep, resonant, guttural “kok-kok-kok”. A bubbling softer trill may sometimes precede this series “prru…prru”. These calls are usually uttered at dawn and dusk. 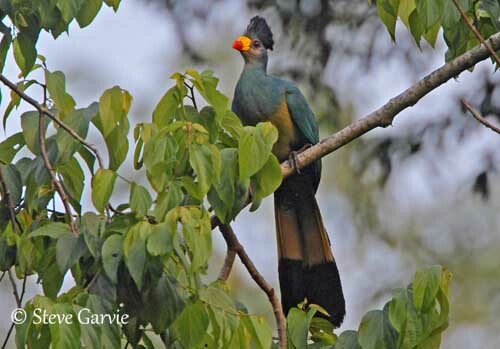 The Great Blue Turaco usually frequents the canopy of forest and gallery forest, and also tall trees in secondary growth. It can be found in low humid forest and montane forest, and forest patches in savannahs. It can be seen from sea-level to 2700 metres of elevation. The Great Blue Turaco is found in equatorial W Africa, from Guinea to Nigeria, and from the Congo Basin to Kenya and Tanzania. The Great Blue Turaco is not a good flier. It performs some soaring glides from a tall tree, ending harshly into the low branches. It climbs again into another tree and descends in the same way. It performs weak and laboured flight when moving to distant fruiting trees. The breeding season varies according to the range. Both adults build a platform with a shallow rim, made with dry sticks. The nest is placed in tall leafy tree, between 8 and 25 metres above the ground, and often over water. The female usually lays 2 pale blue eggs which are almost spherical. Both parents incubate during 29-31 days. The chicks are continuously attended by parents at nest during 27-29 days. They are fed by both adults, often assisted by a helper. At four weeks of age, the young climb around the nest, and are able to make short flights in the tree at 27-33 days. They leave the nest 5-6 weeks after hatching, but parents remain with them until they are able to fly better. The young are still fed for up to three months.